Lemongrass is working with NetFoundry in the development of a new SAP S/4 AWS Solution Space release to provide an agile, secure connectivity for their customers. NetFoundry announced the expansion of its partnership with Lemongrass Consulting to deploy fully production-ready SAP S/4 environments, harnessing NetFoundry AppWANs for connectivity, with security and performance over the Internet in just a few hours. Lemongrass Consulting is an Advanced & MSP certified AWS global partner specializing on migrating, automating and running SAP-centric enterprises on Amazon Web Services. Lemongrass is working with NetFoundry in the development of a new SAP S/4 AWS Solution Space release to provide an agile, secure connectivity for their customers. Lemongrass plans to optimize their customers’ time-to-deployment timescales while streamlining their own processes by engaging with NetFoundry connection technology. Lemongrass automation can enable the rapid deployment of SAP landscapes, however establishing the customer to AWS connection can sometimes represent both a significant cost and time challenge. NetFoundry makes it easy to spin up highly secure, performant, edge-to-cloud networks to cloud providers such as AWS over the Internet using our web-based orchestration tools and APIs with micro-segmented networks called AppWANs. AppWANs can be deployed to connect anything (from users to ancillary applications) over the Internet, to cloud-migrated workloads with dynamically optimized performance and a robust, multi-dimensional security posture. NetFoundry brings agility, security, and speed that traditional connectivity solutions can’t match. Networks can be spun up instantly using virtual gateways that are pre-built for AWS. NetFoundry enables Zero Trust application-specific connectivity across the public Internet through sub-network isolation, identity-bound connections and enhanced data transport performance. Public cloud providers such as AWS typically offer advanced and interconnected global networks capable of linking regions and customers over a diverse range of connections types and sizes. While this provides a rich set of options to connect customers across the public cloud provider’s ecosystem, a local connection is still required to the nearest point of presence. These are typically either IPSec VPN tunnels over transient Internet connections with variable speed, or MPLS lines which are both highly expensive and time intensive to establish. Workload migration – Spin up secure, software-only AppWANs directly to AWS VPCs over existing Internet connections without sacrificing security or speed. Since NetFoundry’s AppWANs encapsulate TCP in the more performant UDP protocol, while dynamically optimizing data flows to follow the best performing paths across our global network fabric, the time it takes to migrate data from on premises to public clouds such as AWS is drastically reduced as compared to traditional VPNs. Post-migration connectivity – Establish micro-segmented AppWANs between users, data centers, other cloud providers, and the cloud migrated application. 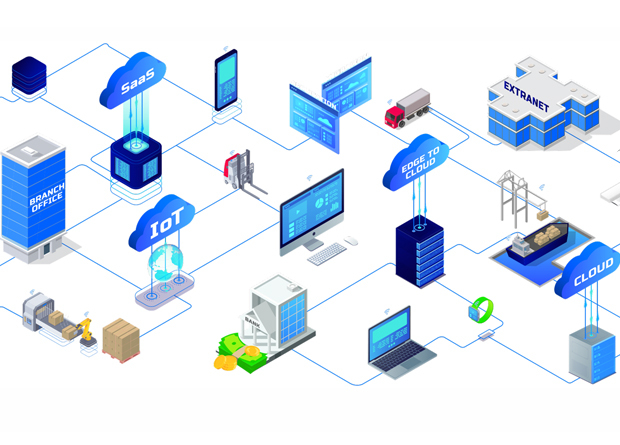 Customers can rest assured that data-in-motion is protected, because each AppWAN built with the NetFoundry platform is fortified by a multi-dimensional security architecture which isolates, encrypts, and protects data flows, resulting in Zero Trust, private, dark networks over the Internet, micro-segmented by application. Post-migration change management – Inevitably, changes have to be made, such as connections to ancillary applications that may have been overlooked in the initial migration, or to accommodate growth. Since spinning up AppWANs is quick and easy, oversights and growing pains can be mitigated in a matter of minutes, rather than days or weeks with other connectivity options. NetFoundry AppWANs can greatly facilitate enterprise application deployment such as SAP on AWS. Backend services for an application will typically be spread across AWS Regions, private data centers, hybrid cloud and multi-cloud environments. Enterprise applications on AWS such as SAP may require three categories of compliant and performant access connectivity, each of which can be easily implemented and operated using NetFoundry AppWANs. NetFoundry delivers a new level of network agility to businesses embracing cloud migration and modern application practices. Now, with Lemongrass and NetFoundry, enterprises can experience the efficiency, security, speed, agility, reliability and profitability that is associated with digital technology and cloud migrations without the hassle and headache. “Lemongrass often find establishing customer connections can be a challenging area, MPLS lines are both expensive and slow to implement, and MPLS lines in some regions can be bandwidth constrained. Their customers can rest assured that data-in-motion is protected, because each AppWAN built with the NetFoundry platform is fortified by a multi-dimensional security architecture which isolates, encrypts, and protects data flows, resulting in zero trust, private, dark networks over the Internet, micro-segmented by application.” said Michael Kochanik, Global Head of Revenue and Alliances at NetFoundry.